NTRUEncrypt is lattice-based and not known to be breakable even with quantum computers. Commonly used cryptosystems like RSA or ECC, on the other hand, will be broken if and when quantum computers become available. In addition, NTRU is significantly faster than other public-key cryptosystems. 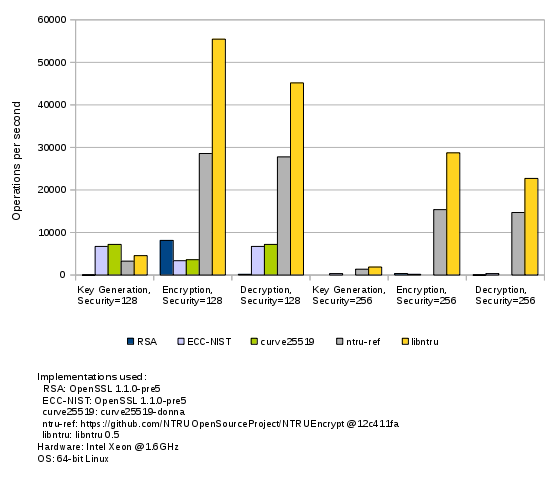 The chart below compares the C implementation (libntru) against other cryptosystems and against the NTRU reference implementation. For an in-depth description and cryptographic analysis please refer to the "Resources" section to the right. Java source code is available on GitHub; compiled jars can be downloaded from SourceForge. The C source code is available on GitHub. Copyright (c) 2011 Tim Buktu. All rights reserved. Design by CSS Templates.